Promote wellness and fight obesity in your community with a fantastic outdoor gym from Greenfields. The premier addition to any park or greenspace, Greenfields' Professional Series units bring a unique element to the outdoor gym. With eight resistance levels, these adjustable units provide a challenging workout for users at varying levels of fitness. Combine the Professional Series units with Greenfields' Core and Accessible lines for an outdoor gym that's fun, versatile, accessible and free. ActionFit by UltraSite encourages healthy, active outdoor exercise while addressing the critical four elements of fitness: aerobic, muscle strength, balance/flexibility and core. ActionFit emulates equipment found in gyms, but is built to last outdoors. Since it's outside, people can work out when it fits their schedule, plus get the proven benefits of outdoor exercise. With outdoor-specific durability, 20 equipment choices and easy pre-configured kits, ActionFit can help your community be more active. Get the benefits of rope training but in less space, without needing an anchor point, with SandRope™ by Hyperwear®. The SandRope is a neoprene tube packed with 15 or 30 pounds of shifting sand in just 10 feet of space—way shorter than other ropes. Included is the optional anchor kit, pre-filled rope and collar. City Art Gym—the Swedish combination of sculpture and outdoor gym—is now available in the United States and Canada. The three elegant pieces in stainless steel are designed so that everybody can exercise on them, regardless of age or fitness level. City Art Gym can be placed in a park, at a city square, on a boardwalk, on the beach, at the schoolyard, or on the grounds of a housing development or corporation. GymValet® is the perfect holder for the most effective and economical fitness and exercise equipment sanitizing system—disinfectant spray bottles and towels. GymValet attaches directly to cardio and strength equipment, placing sanitizing supplies precisely where they should be—on the equipment, at every exerciser's fingertips. Convenient cleaning is your best guarantee against user-to-user germ and virus transmission, and unsightly and smelly sweat-soaked fitness and exercise equipment. Eliminate expensive waste from wipes and paper towels, and save up to 95 percent on equipment cleaning costs. Since 1988, WaterRower has combined stylish design, handcrafted workmanship, unique WaterFlywheel resistance and ethically sourced materials to create the world's finest rowing simulator. Made in America, WaterRower continues to expand its commercial presence, with group fitness programs, ShockWave and Indo-Row, enjoyed within hundreds of fitness facilities around the world. Fit4Sale provides new and remanufactured fitness equipment, support and education for the growth of its existing and new customer base. It is Fit4Sale's goal to provide the very best quality products and services that directly affect the success of its customers and partners. Fit4Sale can ship worldwide and supply any size order. 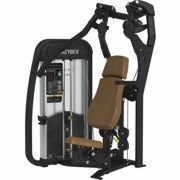 Life Fitness, Cybex, Star Trac, Precor, TechnoGym and other major commercial brands are available, including accessories, flooring and dumbbells and plates. New for 2015, the 15-piece Eagle NX strength line features restyled aesthetics, refined movements and reimagined user features designed to provide users of all levels with safe and effective progressive training options. Eagle NX features Dual Axis Technology, which provides a choice of machine-defined or user-defined paths of motion. For lower body, the patent-pending range-limiting devices ensure the integrity of the strength curve, regardless of the user's size.